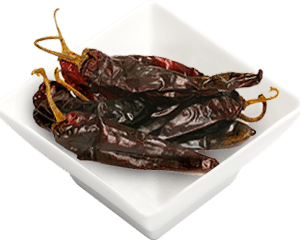 Guajillo Chillies are the dried version of the Mirasol chilli and are very common in Mexican cuisine along with Chilli Ancho. It is a large chilli (3 to 6 inches in length) with thick skin and red-orange tones. It has a medium piquancy with a slightly fruity and light smoky flavour. It is used to flavour meats and sauces. Guajillo Chillies are the dried version of the Mirasol chilli and are very common in Mexican cuisine along with Chilli Ancho. It is a large chilli (3 to 6 inches in length) with thick skin and red-orange tones. It has a medium piquancy with a slightly fruity and light smoky flavour. It is used to flavour meats and sauces. For optimum results and flavour, re-hydrate the chillies for 20 minutes in boiling water before use. Toast before use to add to enchiladas, salsas, sauces, soups, stews and tamales. Combine with Ancho and Pasilla chiles to make Mexican moles. Because of its thick skin the Guajillo chilli requires a longer soaking time to rehydrate than most other dried chiles. Use to make Harissa, a hot chilli paste used in Tunisian cooking. All chillies – including Guajillo Chillies – contain capsaicin, a compound known to have many health benefits including boosting the immune system, eliminating inflammation and aiding in weight loss. It also is known to help with arthritis, cardiovascular disease, gastric ulcers, vascular headaches, infections and respiratory conditions.